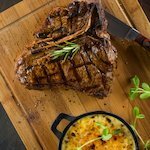 Situated in the heart of Somerset West in the popular Waterstone Village Shopping Centre, The Hussar Grill Somerset West opened its doors in October 2014. Stop by for an authentic grill room experience complete with an old-school style interior and your favourite cut of their steak, while overlooking the majestic Helderberg mountains. The 2-course lunch special, which unfortunately ended 31 October, was great value for money. The menu provided a choice of 3 starters and 3 main courses. It satisfied everyone's needs. All three couples were highly delighted with the very tasty food and the size of the portions. The "chicken livers" and "parmesan chicken" are highly recommended. The complementary olives and potato shavings are simply “very lekker”! The "No Corkage" policy of Hussar Grill makes a visit worthwhile.